Hamburg, Germany, 15 March 2017. 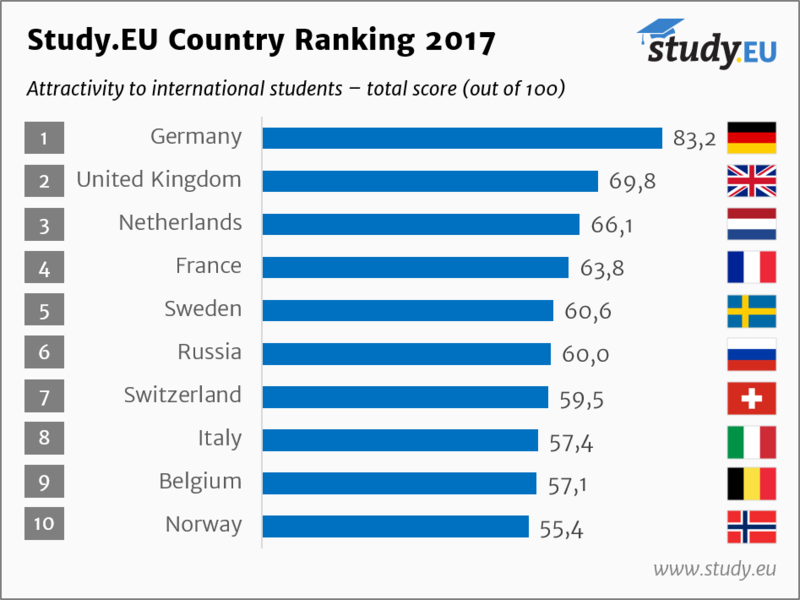 In the newly published Study.EU Country Ranking 2017, Germany ranks as the most attractive country for international students, followed by the United Kingdom and the Netherlands. Thirty European countries were ranked based on scores in three dimensions: Education, Cost, and Life & Career. Germany achieved high ranks across the board, offering high-quality teaching at many well-ranked universities. While the UK scored well for academic reputation and the number of available study programmes, it was the most expensive country in the sample. The Netherlands, France and Sweden follow in the top 5. Life & Career (up to 20 points), considering the country's score in the UN's World Happiness Report, the local unemployment rate among the tertiary educated as well as the local proficiency in English, to judge both the quality of life as well as the chances of international students breaking into the labour market after graduation. Study.EU is the gateway to universities in Europe. As one of the leading information providers for study choice in Europe, it offers students details about more than 7,000 study programmes all over Europe. The Hamburg-based company connects students from around the world with European universities, enabling them to pursue the academic path they aspire. Study.EU closely cooperates with institutions of higher education as well as governmental organisations throughout Europe. Career in Supply Chain Management & Logistics: What to study? Cookies & data analytics help us deliver our services.